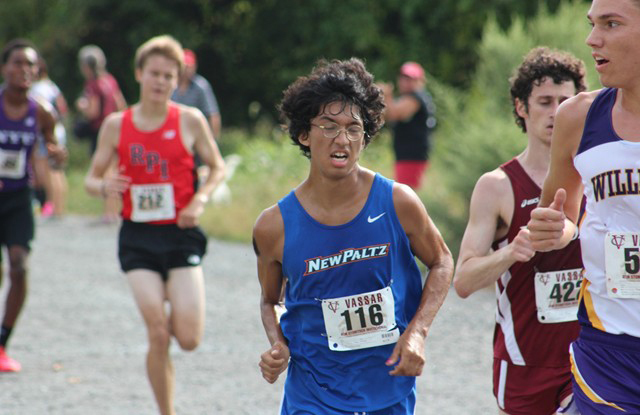 GLASSBORO, N.J. – Senior Galo Vasquez paced the State University of New York at New Paltz men’s cross country team to a 20th-place finish out of 44 teams at the 2016 NCAA Division III Atlantic Region Championship meet, hosted by Rowan University, on Saturday afternoon. The Hawks collected 506 points for the day. Vasquez finished 23rd out of 303 runners, covering the eight-kilometer course in a school record time of 25:03.3 to earn All-Region accolades. Junior Stephen Smith placed 82nd in 26:07.0 while senior Josh Korn earned 103rd-place with a time of 26:22.2. Senior Ian Detweiler was the next Hawk runner to cross the line, clocking in at 26:48.0 for 137th overall while junior Barrett Celecki followed behind in 27:17.4 to place 165th. Senior Joe Richards earned 168th-place with a time of 27:20.9 while sophomore Thomas Rizzo rounded out the New Paltz harriers in 28:35.2, placing 220th. SUNY Geneseo topped the field with 51 points to earn an automatic bid to the 2016 NCAA Division III Championships. RPI earned the runner-up spot, and a bid to the championship meet, with 87 points while The College of New Jersey finished in third with 169 points. The Knights’ Isaac Garcia-Cassani earned individual honors with a time of 24:15.8.